Since 1994 Robin Lofton has lived in Europe, making her home in London, Stockholm and currently in Brussels, Belgium. She received her history with honors from UCLA, a J.D. from the University of Pennsylvania Law School, and an LL.M in International Law from the Rijksuniversiteit Maastricht in The Netherlands. 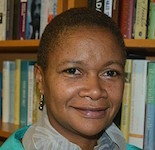 Ms. Lofton has worked in Washington, D.C. as a lobbyist on human rights in South Africa and Brazil. She served as Executive Director of the International Centre for Criminal Law & Human Rights, focusing on the death penalty as a human rights crisis. She wrote articles about human rights in criminal justice systems worldwide and drafted amicus curiae briefs introducing and promoting international human rights law and standards in the U.S. Circuits courts. Ms. Lofton continues to write and lecture about African American history and the Black experience in America. She has authored numerous articles about African American history, including articles on slavery, civil rights and current events globally that affect African Americans. Her writing also includes perspectives about Black experiences—in and out of the United States. Her goal is to bring history to life and use the lessons of the past to create a stronger future.